When I was six years old I desperately wanted WrestleMania for Nintendo, as I was obsessed with the WWF. Christmas day at my Gram's house I began snooping under the tree till I found what I was certain was a video game, and tore part of the wrapping to be sure. Indeed it was WrestleMania. But then I had something of a freak-out, and decided that instead of being caught red-handed, I would take the present out to the backyard and bury it in the dirt. Later that evening as our entire family was opening presents, my Gram confusedly said something to the effect of, "Jacob, I think you're missing a present." I tried to play it off, ran out back and unearthed WrestleMania. I then brought it back inside and promptly began to weep like the child that I was. Touching story, huh? Well, not really. 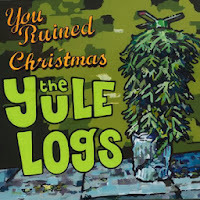 But The Yule Logs have no peers when it comes to putting out first-rate holiday music, featuring both classic and original tunes. This song's a good example of that, and I urge you to buy one or more of their records to brighten your home during the holidays. The MUSIC page on their website contains a list of available albums, and you'll find links to various online vendors under each of the album pictures. 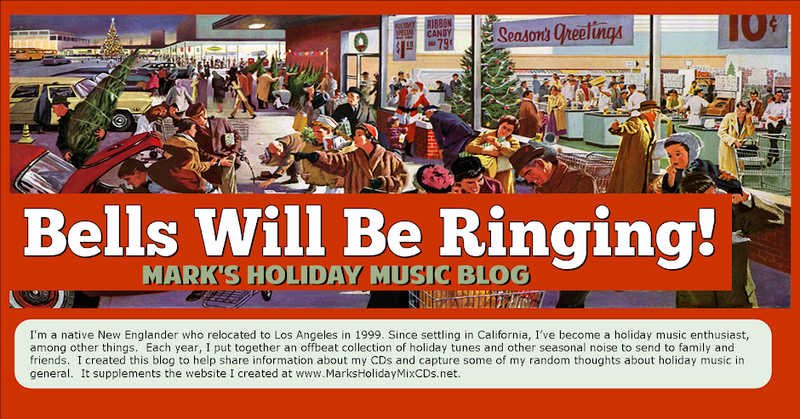 I've used 398 different songs on my various holiday mixes to date, but only a handful of performers show up on the cumulative track list more than once. Six different songs by Johnny "Bowtie" Barstow have appeared on previous mixes I've circulated, which puts him in first place, followed by William Hung and Wing, who are tied for second place with four appearances each. 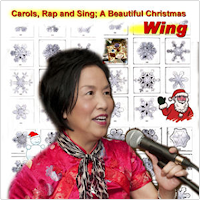 This year's mix includes the fourth track I've used from Wing, which she calls "I'm Dreaming of a White Christmas," also known simply as "White Christmas." The song was written by Irving Berlin in 1941, although there's apparently some dispute about where it was written. Several reports suggest it was written at the La Quinta Hotel in California's Coachella Valley, although Phoenix's Arizona Biltmore Hotel claims Berlin wrote it there. There appears to be general agreement about where and when it was first performed in public: Christmas Day 1941 on NBC Radio's Kraft Music Hall show by Bing Crosby. Crosby's performance was well-received, but it wasn't until the following year when the song was featured in the Paramount film Holiday Inn that it really caught on. At first, it was overshadowed by another song from the Holiday Inn soundtrack, but as Fall arrived, it started to climb the record charts, eventually reaching the #1 position, where it remained for 11 weeks. "White Christmas" charted again when it was released several years later, reaching the #1 spot in both 1945 and 1946. One factor that probably accounts for its phenomenal success is its popularity with American soldiers during World War II. After all, the song played to people who were feeling melancholy ("Just like the ones I used to know") and eager for images of home ("Where the tree tops glisten"). For many years, this was the uncontested champion of the bestselling single contest, with total worldwide sales of over 50 million copies (100 million, including copies that were sold on various LPs in addition to the 45 RPM single version). In recent years, the song's faced competition from Elton John's tribute to Princess Diana, "Candle in the Wind 1997." But according to the latest Guinness Book of World Records, Bing Crosby's "White Christmas" retains the title of bestselling single of all time, an honor it's held consistently since the Guinness people published their first records book in 1955. This song has been recorded by hundreds of acts over the years, but I guarantee you've never heard a version of it quite like Wing's. I'm indebted to John Waters for introducing me to this song – and for lots more, if I'm going to be honest about it. 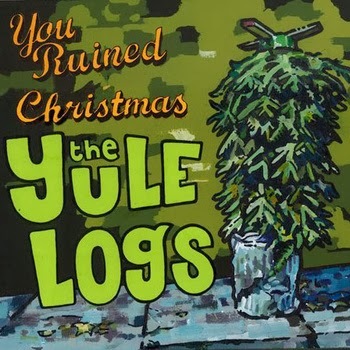 This one appeared on the wonderful album A John Waters Christmas, along with several others I've used previously such as "Little Mary Christmas," by Roger Christian; "Happy Birthday, Jesus," by Little Cindy; and Tiny Tim's version of "Rudolph the Red-Nosed Reindeer." This is sort of ironic because Teddy Vann wound up suing Waters for including the song on his album without first securing the proper approvals and making arrangements to pay for using it on a commercial venture, although it's likely Vann's real beef with Waters was the fact that Waters had called the song a "crackpot carol" and a "lunatic holiday song." I can't agree with Waters about those descriptions. "Happy Birthday, Jesus" is a crackpot carol; "Santa Claus is a Black Man" is a delicious period piece that represents what Teddy Vann was all about – namely, multiculturalism, joy and respect. Vann, who died in 2009, is a Brooklyn record producer who won a Grammy in 1991 for co-writing the Luther Vandross smash "The Power of Love/Love Power." He was one of the early adherents to the Black Consciousness movement of the 1960s, although he was also quick to celebrate the history and achievements of people of other backgrounds, too. I understand he learned Yiddish so he could communicate more readily with some of his older Jewish neighbors. This song features his daughter, Akim, who claims to have seen Santa Claus in the living room with her mother the previous evening. She reports that Santa looked like her Daddy in that he was black, handsome, had an Afro, and was really out of sight. This is one of the few songs I've heard that wishes its listeners both Merry Christmas and Happy Kwanza. It's a great holiday song by any measure, and I can't imagine why it's not in the heavy airplay rotation at radio stations across the country at this time of year. Oh yeah, that's right – we need to hear that abomination by Wham! more often. BULLETIN! BULLETIN! (12/16/13): I've just seen the tail end of a story Chris Hayes reported on MSNBC tonight concerning a brewing dispute about Santa Claus's race. 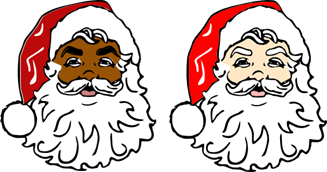 It seems Fox TV personality Megyn Kelly recently reported that both Santa and Jesus Christ are white, and that because these are indisputable facts, there can be no further debate on the subject. 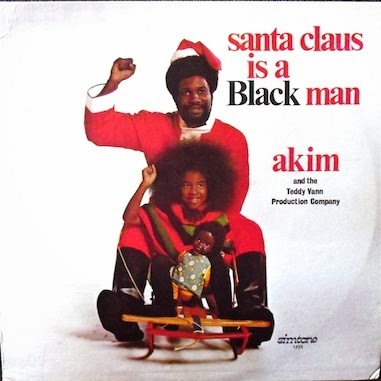 Because this report calls into question one of the many assertions made by this blog (see "Santa Claus Is a Black Man," above) I feel compelled to investigate. I haven't time to do this vital story justice tonight, however, so I'll simply post a link to the Media Matters report on the story and promise to add a new post when I'm able. More tunes from C'est Noel! examined tomorrow! Don't Miss Darlene Love on Letterman TONIGHT! It's a Big Weekend for Andy Cirzan Fans! Look Who's Back to Say "Happy Holidays!" Making Sense of "Baby, It's Cold Outside"